ALTILIS is the species name of breadfruit, a staple food crop in the Pacific Islands and the key active ingredient in all ALTILIS beauty® products. While studying at the University of British Columbia in 2017, Kenna Whitnell discovered the skin care benefits of the breadfruit male inflorescences (flowers). From the breadfruit flowers she developed an extract, isolated the compound responsible for bioactivity, and structurally characterized it as a bioflavonoid with higher antioxidant activity than vitamin E and vitamin C.
When formulated into products, the breadfruit flower extract is soothing, protective and skin brightening. This rich bioflavonoid extract contains tyrosinase inhibitors, responsible for protective effects including reversing and preventing the appearance of sun spots and age spots cause by UV radiation. 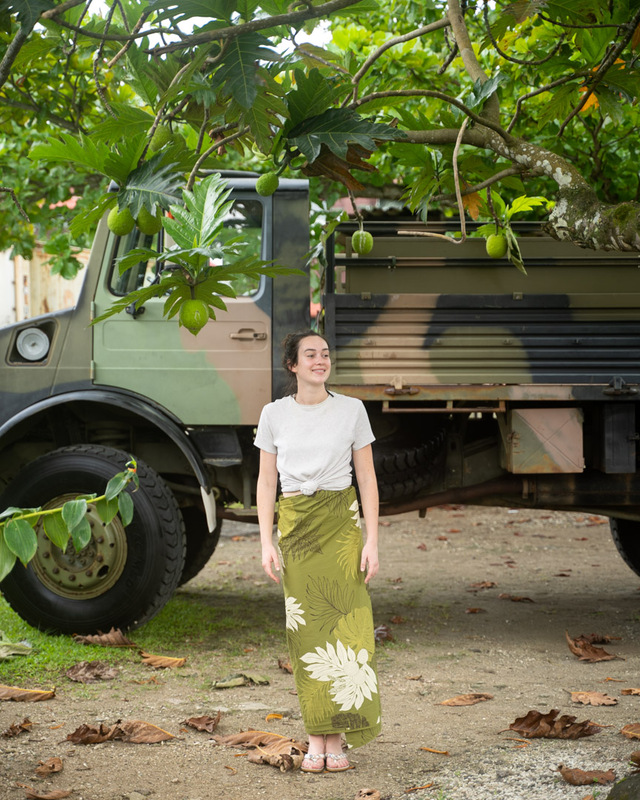 Through this new ingredient and product development, Kenna works closely with local partners in Samoa, to source breadfruit flowers for the ALTILIS beauty® line. This partnership brings new income opportunities into the communities in which breadfruit grow abundantly, supporting a staple crop is an essential part of community, traditions and health. Learn more about the skin care benefits of breadfruit. ALTILIS beauty® is partnering with small, local companies in Apia, Samoa to create unique breadfruit ingredients for cosmetic products. Every Samoan family has breadfruit trees and has uses for almost all of the different parts of the tree. The wood is used for building and carving. The latex is used as a glue and to prevent fungal infections. The flowers are soaked in coconut milk and honey and eaten as a sweet treat. Our partnership is providing income generation opportunities and encouraging replanting of the trees. The lack of a continuous market has seen many families remove trees and we are encouraging replanting as well as pruning before the cyclone season to avoid damage to the trees. Breadfruit trees benefit families and communities with sustainable food security and conservation of traditional knowledge. Company founder and CEO Kenna Whitnell first began experimenting with ingredients and formulations as a teenager searching for a natural solution for acne and dry and sensitive skin. While experimenting with plant based ingredients, and bringing to market a few aromatherapy products under the brand ‘Soleluna Cosmetics’, she noticed two growing trends within the natural product industry; the adulteration of raw materials, and unsustainable plant material sourcing. She knew there had to be a way of enjoying the benefits of plants, without compromising the planet. Her search led her to breadfruit, incredibly rich in unique and powerful phytochemicals with antioxidant, soothing and protective benefits for the skin. The compounds present in the extract scavenge free radicals that damage and age skin, provide anti-inflammatory and UVB-protective properties and replenish the skin’s natural protective barrier for a glowing complexion. Biochemist and expert formulator, Kenna is a leader in the natural skincare and natural health product industry for innovating new products and working with industry experts and leaders to develop high performance, sustainable natural health products that are good for people and the planet. Kenna has developed a process to extract the active compounds from breadfruit flowers and has formulated a cleanser, serum and moisturizer for a simple, all natural three-step skincare routine. The InforEssense product line, launched December 2017, also features other natural, beneficial ingredients like Gotu Kola, Honeybush, Aloe Vera and Trans-Resveratrol for additional rejuvenating effects. Kenna sources breadfruit directly from microfarmers in Samoa, increasing the value of an important food crop and providing important economic, social and environmental benefits to their communities. We do not believe in using plants for marketing purposes. We use high amounts of active ingredients for ultimate skin health and aging prevention. All ALTILIS Beauty® products are formulated based on scientific evidence and traditional knowledge. Active ingredients are used at their most effective concentrations to achieve maximum skin benefits, while still being gentle and mild on sensitive skin. The cosmetics industry is heavily saturated with products containing raw and botanical materials that are sourced unsustainably. ALTILIS Beauty® is actively seeking renewable and sustainable source material. Adulteration of botanical materials is a large issue in the cosmetics industry. Often materials that are less available are adulterated. These products are often diluted with more inexpensive oils. We are proud of our process and want to share every aspect along the way from sourcing our plant materials from farmers, making our own raw materials from renewable sources, and production in our facility in Toronto, ON.